Chequer Mead - Blog - Chequer Mead Theatre Goes Green! Work to install 108 Trina solar module panels on the roof of Chequer Mead Theatre’s main auditorium has been completed and now Chequer Mead are able to start using their own generated power! 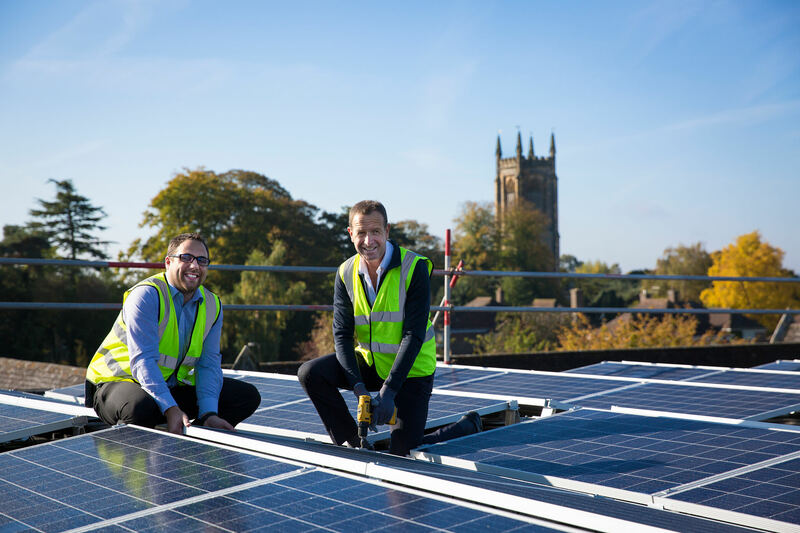 Chequer Mead decided to employ the work of SAS Energy by choosing to install 108 panels to help reduce its impact on the climate with its carbon emissions and reducing its reliance on fossil fuels within the building. The system will provide energy throughout the day, creating a significant amount of power for the theatre's requirements. Chequer Mead's General Manager, Will Perkins said “It’s really exciting to now have the theatre powered by solar energy especially as we enter our busiest season; as always there’s lots going on for everyone including our famous pantomime which this year is Peter Pan! This has been just one of many major projects for us over the last 12 months and has been generously part-funded by the MSDC Section 106 Grants Scheme along with other recent projects including our recently refurbished rehearsal spaces which now include a state-of-the-art dance studio. Working with SAS Energy has been easy from the start, making life very easy for us to go green”.